The Stihl TS 410 is a compact yet high-powered petrol cut-off saw. It’s fuel efficient, easy to start, and requires little maintenance for its air filter. It features an integrated water supply so that the saw is lubricated for hard materials, while also suppressing harmful dust particles. Reduced-Emission Technology – Most petrol powered saws produce a high amount of carbon emissions which impacts the saw operator and the environment around him. It can affect the health of the operator and surrounding people. This leads to illnesses such as asthma, allergies, and other respiratory diseases. This is why the Stihl TS410 Petrol Cut Off Saw is an advantage when it comes to fuel emissions. Its produces significantly lower fuel emissions than regular 2-stroke motors. This ensures the operator and the surrounding environment aren’t affected by emissions. High Performance and Fuel Efficient Engine – Regular 2-stroke motors tend to be inefficient with fuel usage, and also aren’t particularly high powered. It leads to higher fuel usage to produce the same output of a better performing engine. This means greater fuel costs in the long run. 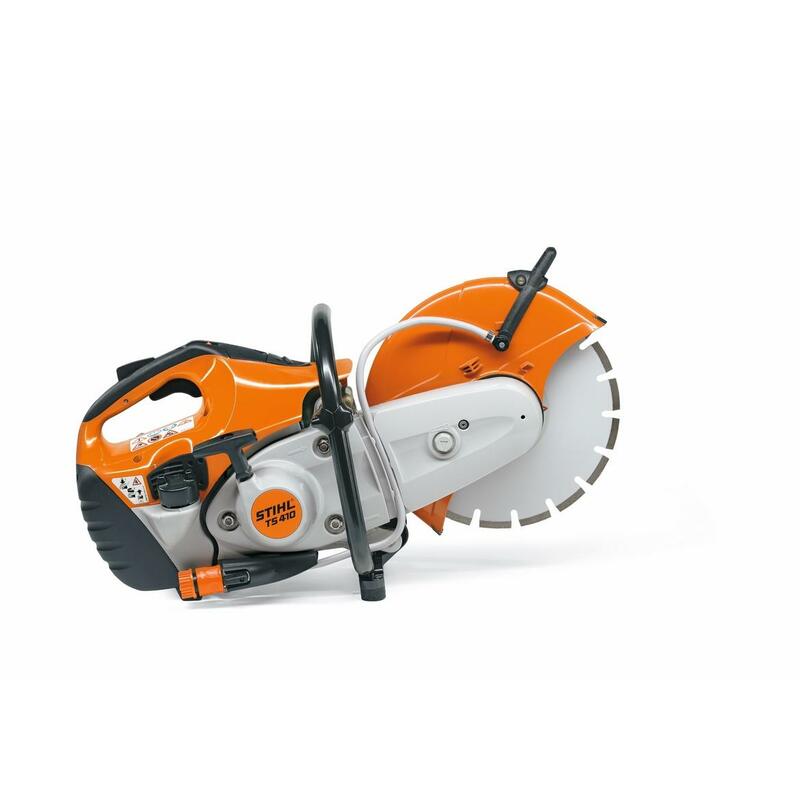 The TS410 cut off saw doesn’t have this problem as it has a 2-stroke engine with a stratified charge – which results in more power from 20% less fuel consumption when compared with regular engines. So you’ll get higher performance at a lower fuel cost in the long run. Easily Start the Saw With A Few Pulls – Ever had problems starting a saw? You’ve probably had to pull the starter cable many times before even getting a slight rumble and even then it didn’t start. This is usually because the carburettor doesn’t have adequate fuel for the engine to get started. With TS410 the manual fuel pump fills the carburettor with the right amount of fuel with the touch of a button. You’ll then be able to start your saw with just a few pulls of the starter cable. Long Lasting Pre-separation Air Filtration System – Air filtration systems on regular saws typically don’t last very long and require frequent replacements. This is because they don’t pre-separate the air and remove the larger particles before sending it through the air filter. So, your saw is put out of action while the filter gets replaced and your maintenance costs increase. This is both an inconvenience and money waster. You won’t encounter this problem with the TS410. The pre-separator duct ejects larger particles. The pre-separated air is then sent to the air filter. This means the air filter lasts longer and doesn’t require frequent replacements. It saves you money and the inconvenience of servicing your saw. stihl is the king of work horse cutters in my opinion,been using them longer than I care to remember. The 410 is almost indestructible,look after it and it will last years.nothing bad to say. Not actually had chance to use this product yet, but I can’t rate this business enough. Price and delivery were very impressive. Thank you.